Our Sundays are slow paced and relaxing. There is always some baking and cooking on Sundays. Kids want to have something ‘special’. This ‘special’ is really ambiguous and I always try my best to interpret it. Is it a new recipe that they are looking forward to? Or do they mean their old favourite recipe? But by and large anything with a twist fits the bill. This Sunday, we baked something special. 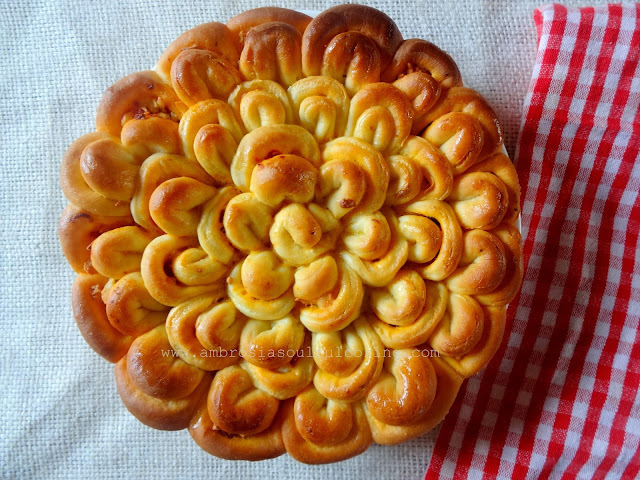 We baked a beautiful Chrysanthemum Bread. We filled the petals with pizza sauce and cheese. It was great fun to shape the petals. Arranging the petals in the pan was done with great precision from our side. While the bread was rising and baking, we sat out on our veranda in the soft and mellow winter Sun. How beautiful are Sundays! The lazy mornings and languid afternoons. We saw a butterfly sunning herself in the Magnolia tree. 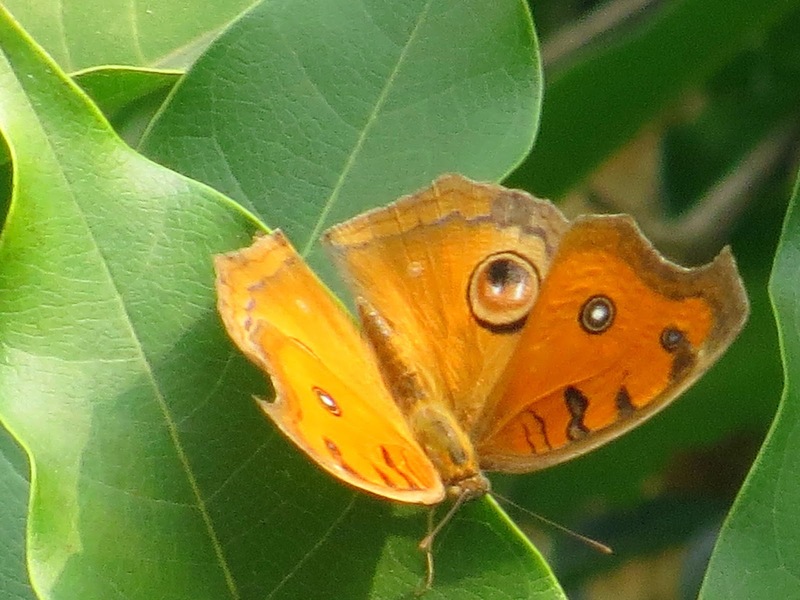 And another butterfly in the fireball plant. I was waiting to bake this bread since long. Bread Bakers gave me a perfect reason to go ahead with it. We loved to pull out the petals and enjoyed the bread. Mix milk and honey. Stir in yeast. Cover and keep for 10 minutes. The yeast will turn frothy. Add all the ingredients to the flour mix and knead to for 6-8 minutes to get a very soft, smooth and elastic dough. Add more warm milk if the dough feels a little hard, or, add more flour if it feels too sticky. Transfer dough to a greased bowl. Turn around once so that it is evenly coated with oil. Cover with a kitchen towel and keep in a warm place for 1 to 1 ½ hours or until double. Gently punch the risen dough, and divide into two pieces. We will work on one portion at a time. Keep the other portion covered. Dust the working counter with some flour. Roll out the first portion to 3 mm thickness. 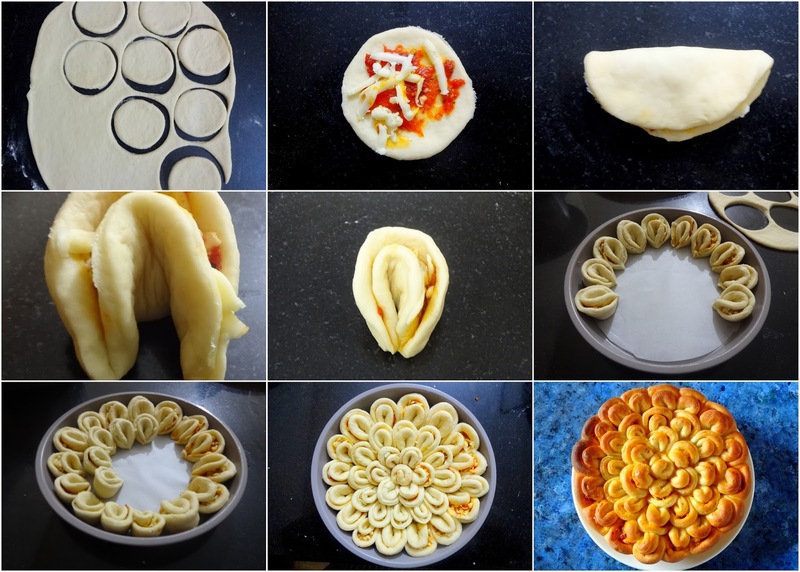 Using a cookie cutter or a glass, cut out circles of about 3 inches from the dough. 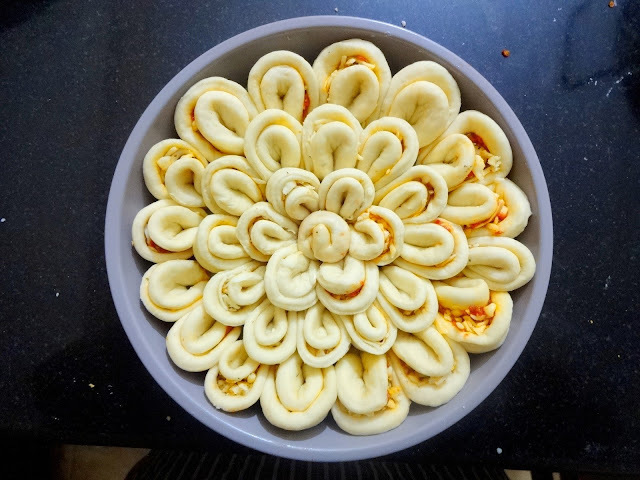 Reshape the remaining dough, roll out again and cut the circles. Repeat with the second portion. Take 1 teaspoon of pizza sauce and spread around the circles leaving the edges. Add 1 ½ teaspoon of grated cheese. Fold the circles into half to get a semicircle. Fold it in half again. Now bring the edges together to get a petal. Pinch the edges. Arrange the prepared petal around the edge of the prepared pan. The point of the petals should be towards the center. Arrange the petals in two rows. For center, take two filled semicircles and intertwine the halves. Cover with a kitchen cloth and keep in a warm, place for 25-30 minutes. Prepare glaze by beating yolk and milk. Brush the bread with the glaze. Bake for 15 minutes. Lower the temperature to 175 degrees. Bake for another 10 minutes. The top should turn golden. Cover with a foil if it is browning too fast. Remove from the oven after 10 minutes. Shift to the cooling rack. Brush with melted butter. Our host this month is Kelly from Passion Kneaded. 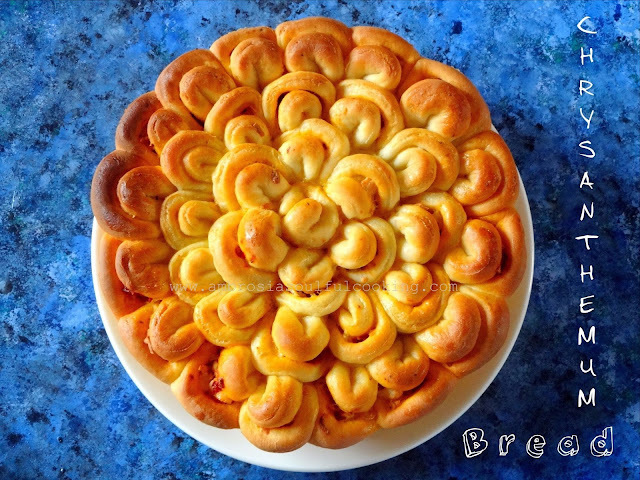 Her blog is a must visit for lovely breads. 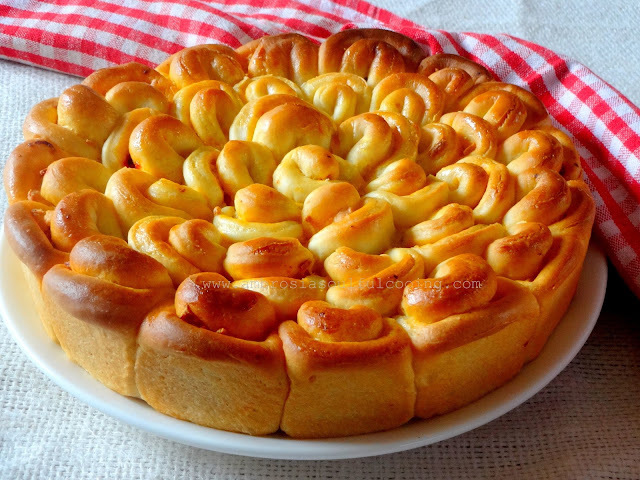 She chose pull-apart bread this month. Thank You Kelly!we loved the theme and enjoyed baking bread. That takes a lot of effort and it is so beautifully done! It's a pleasure to look at the bread. Good idea ! What a gorgeous loaf and then to have it filled with a pizza surprise...perfect. Wow, what a pretty bread. I bet the kids absolutely loved it! This bread is so pretty! I'm sure it was a lot of work but it's just a stunner and I can only imagine how delicious! I have this bread with pizza sauce, cheese, and pepperoni in it on my blog, but my shaping is not nearly as gorgeous as yours. Beautiful. This Chrysanthemum bread sure is a very special treat for any occasion. It looks absolutely stunning. I've pinned it -- hopefully I can try it some time this holiday season. Special?? Even I am stumped at my kids demand for special and mind you my elder one is 24. yet to decipher what she means by special. Lovely bread I am sure this will fill the bill for special. Looks yum. Namita such a beautiful bread. I have it bookmarked but chickened out thinking its too much work! Love your step by step clicks. 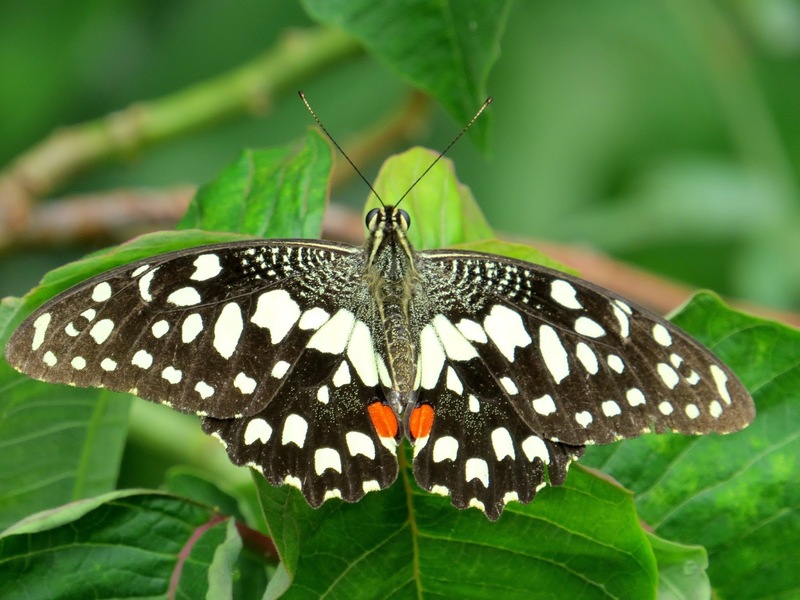 The butterflies look so beautiful. Gorgeous bread, can't take my eyes off it.